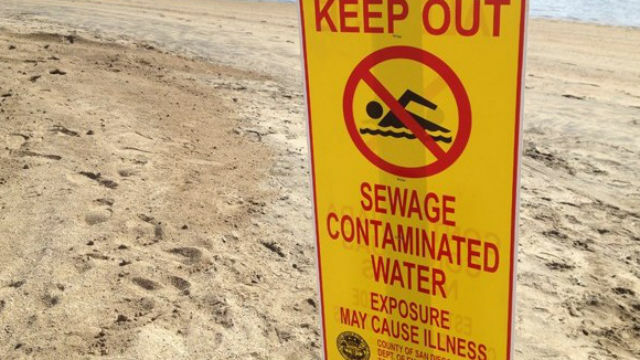 A warning sign for contaminated beach water via San Diego County. A portion of the beach in La Jolla remained closed Saturday after a sewage spill. County officials closed a stretch of shoreline at Windansea Beach around 9:30 a.m. Friday after learning of leaking sewage near Neptune Place and Westbourne Street. A sewage line became blocked with pieces of concrete, causing sewage to overflow out of a manhole cover and into a storm drain that runs into the ocean near Windansea, a city utility supervisor told NBC San Diego. The spill was contained, but not before more than 100 gallons of sewage were dumped into the water in the area, according to media reports. People were still being asked not to go into the water there Saturday morning. There was no immediate word on when the closure might be lifted. Beachgoers can check closure information from the San Diego County Department of Environmental Health at sdbeachinfo.com.